Thermal maps show the probablity to find thermal uplift at a certain geographical location using a paraglider. The maps are soly based on real flights and void of any model data. A thermal trigger point is a theoretical spot on the surface, where the heated air packages detach from the ground. Wind shift in flyable heights is approximated linearly. A pilot has to be aware of winds in order to actually hit the thermal. 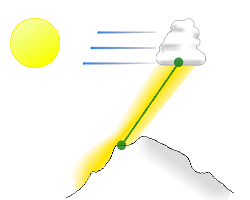 Weather properties such as wind speed, altitude of the cloud base, gradient of the air and so on depend on the given day. However, trigger points (mostly) don't. Surprisingly the global weather conditions are of minor importance if one wants to find the thermal trigger point. However, weather is very important for paragliders since pilots mainly chose the area according to the conditions. Given a certain area, most flights are performed under very similar conditions and the positions of the trigger points are roughly the same. The wind component is limited as much as possible by reducing thermals to trigger points. How good are thermal maps? The main factor for good thermal maps is the flight density in a given area. It was also discovered that maps are generally better if the topology is the main thermal factor. In some regions, only sparse thermal predictions can be shown, since there is only little information available. For example in the flatlands the prediction quality is generally lower, since there are fewer flights and most of them are performed according to cloud position and not according to static trigger points on the surface. Regions with sparse information were kept transparent in order to reduce clutter. Furthermore, thermals next to popular launch pads are generally overrated (the position, however, is correct). This is caused by the fact, that most pilots only upload a flight if they at least catch the first thermal. What do I as a pilot need these maps for? First of all, very good pilots which are familiar with a certain flight area, barely profit from the maps. But the maps proved to be useful for studying a hitherto unknown area: Where do I find my first thermal? Thermal probability is a good idea if no other signs for thermals are available. If one sees a beautiful cumuli, a climbing bird or even other climbing pilots, one has to blame oneself for preferring to follow the thermal maps. A second purpose is the analysis of performed flights (which is especially interesting in GoogleEarth) in order to optimize tactical decisions made by other pilots in previous flights. Hotspots are points where it is likely to find a thermal. They are extracted out of the raster based thermal maps. Again they are time dependent. Their main purpose is an upload into a GPS where they come in handy during flights. Can you create better maps for [my remote location]? Simply do more and longer flights in this area. Only XC flights are considered (based on a minimum distance) and only thermal flights will contribute to the thermal maps. Soaring is filtered out wherever possible. In order to reduce thermal outlyers the current probability model requires a minimum flight density of around 20 flight per 100m square (that's a lot!). Finally upload your flight to any of the main contest sites which allow access to the igc. Namely, any leonardo based server like paraglidingforum or the international XContest (but not closed systems like OLC). Cool, where can I find further reading? The project started off as a master thesis "ParaglidingNet - A Sensor Network for Thermal Research". From this a paper called "Ikarus: large-scale participatory sensing at high altitudes" emerged (it's more technically oriented and less to paragliding). But seriously; this is a lot of theory on sensor networking and such. But what really mattered was to create an open map database for every paragliding pilot out there and to provide simple tools to improve everyones flights. Do note, however, that in the time since this thesis was written the toold and methods used where heavily optimized and extended to new regions. 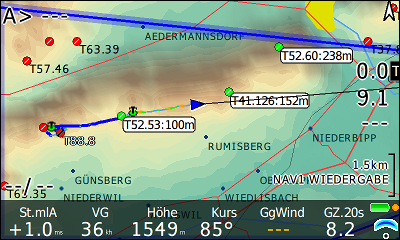 Unfortunately, traditional GPS devices and flight computers cannot show the thermal maps as rasterdata. Thermal hotspots, representing the center regions of high updraft probability, are a vectorized extract of the same data which can be uploaded to most devices. Pick a format suited for your device and limit the amount of hotspots such that they do not clutter your flight area. Many tactical flight computers like XCSoar, Freeflight or LK8000 have the option to show hotspots as dedicated thermal locations. Pick "CUP as thermals" in these cases. It is not advised to use the WPT format on any device except the ones supporting only WPT like Skytraxx 2.0. For any other device use the standardized GPX format if supported or CUP otherwise. The Paragliding Thermal Maps Project by M. von Känel is licensed under a Creative Commons Attribution-NonCommercial-ShareAlike 4.0 International License. If you plan on including thermal tiles into your own map server contact me directly with your expected load. For tracking purposes every remote request has to append an additional &src=[hostname] URL parameter. attribution: "Skyways &copy; <a href=\"https://thermal.kk7.ch/\">thermal.kk7.ch</a>"
The thermal.kk7 project helps paragliding pilots of all skill levels to improve their flight performance. Preparation before flying in new areas, thermal assist while airborne and tools to analyze past flights allows to fly longer, more efficient and safer. Generating new thermal maps is a lengthy, manual process requiring months of my free time, weeks of hot running CPU's and quite some hosting power to deliver. I will continue to drive this project in my spare time free of charge under an open license, but you can keep me motivated for timely updates. This works best if you send me feedback of your experiences and difficulties with the maps. Or simply aid in covering my hardware costs: server, disks, beers, gliders,... happy landings! To reach me, send an email to "info" at ��7.ch. You'll probably guess it from the domain name, but robots won't.